Cardiovascular diseases, including heart failure are a known complication of Human Immunodeficiency Virus (HIV) infection globally. 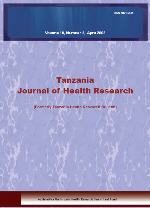 The objective of this study was to describe factors associated with, and echocardiographic findings of heart failure among HIV infected patients at a tertiary health care facility in Dar es Salaam, Tanzania. Clinical, laboratory and echocardiographic assessment was performed in all HIV-infected patients presenting with cardiac complaints at the medical department, Muhimbili National Hospital between September 2009 and April 2010. HF was diagnosed clinically and confirmed by echocardiography. Of the 102 HIV-infected patients with cardiac complaints 50 (49%) were in HF. Commonest causes of HF were hypertensive heart disease, pulmonary hypertension and dilated cardiomyopathy. In multivariate analysis male gender (OR 4.03), low education (OR 4.91), previous history of tuberculosis (OR 3.01), and low haemoglobin (OR 0.83), were independently associated with the diagnosis of HF (p<0.05 for all). In conclusion, heart failure is common in HIV-infected patients with cardiac complaints, and is associated with both modifiable and non-modifiable factors.